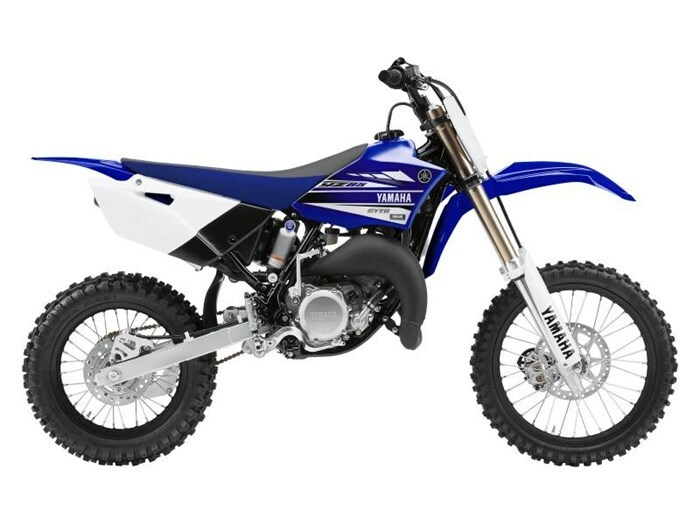 2017 Yamaha YZ85 (2-Stroke) CONQUER DIRT The YZ85 is ready to race right out of the crate with features like a super potent 85cc, crankcase reed-valve 2-stroke power plant, a rigid single backbone frame and adjustable suspension. Join the "bLU cRU" and get ready to fill your trophy case. POWER Lightweight, compact, 85cc, liquid-cooled, crankcase reed-valve inducted, 2-stroke single. FRAME Rigid, semi-double cradle, single backbone, steel frame is lightweight and incredibly strong providing minimal flex for razor-sharp moto-wining handling. Features may include: Potent, easy to service, crankcase reed inducted, 2-stroke power plant Smooth shifting, 6-speed close ratio transmission Compact, semi-double cradle, single back bone, steel frame Race-ready, fully adjustable suspension. Front & rear disc brakes Aggressive, modern styling ENGINE Lightweight, compact, 85cc, liquid-cooled, crankcase reed-valve inducted, 2-stroke single. Crankcase reed valve induction & 28mm Keihin flat-slide carburetor. Lightweight, forged piston. CD ignition system. Smooth-shifting, 6-speed transmission. Heavy-duty, multi-plate clutch. Quick remove, clutch sub-cover. Lightweight radiator with high capacity cores & special louvers to direct the air through the rad. Large capacity airbox with washable, dual-stage, foam filter. Lightweight exhaust system. CHASSIS/SUSPENSION Rigid, semi-double cradle, single backbone, steel frame. Detachable rear subframe. Lightweight box-section aluminium swingarm. Adjustable 36mm inverted Kayaba fork provides 275mm (10.8") of wheel travel. Fully adjustable Monocross link rear suspension provides 282mm (11.1") of wheel travel. 220mm front stainless steel disc with twin piston caliper "Shorty style" adjustable front brake lever. Clutch lever holder allows for clutch lever reach adjustment. 190mm stainless steel rear disc brake squeezed by a single piston caliper. Lightweight, 17" front & 14" rear DID rims Modern, aggressive, slim line bodywork. Sale price does not include freight, PDI, admin, license or taxes.